An international team of astronomers has released the largest ever compilation of exoplanet-detecting observations made using a technique called the radial velocity method. By making the data public, the team is offering unprecedented access to one of the best exoplanet searches in the world. The data were gathered as part of a two-decade planet-hunting program using a spectrometer called HIRES, built by UC Santa Cruz astronomer Steven Vogt and mounted on the 10-meter Keck-I telescope at the W. M. Keck Observatory atop Mauna Kea in Hawaii. "HIRES was not specifically optimized to do this type of exoplanet detective work, but has turned out to be a workhorse instrument of the field," said Vogt, a professor emeritus of astronomy and astrophysics. "I am very happy to contribute to science that is fundamentally changing how we view ourselves in the universe." The data compilation, available on the team's web site, includes almost 61,000 individual measurements made on more than 1,600 stars. An initial analysis of the data revealed more than 100 potential exoplanets, including one orbiting the fourth-closest star to our own solar system. The researchers presented their findings in a paper accepted for publication in the Astronomical Journal and available online. "This paper and data release represents a good chunk of my life work," said lead author Paul Butler of the Carnegie Institution for Science, one of the researchers who helped jumpstart the field of exoplanet science. The radial velocity method is one of the most successful techniques for finding and confirming planets. It takes advantage of the fact that, in addition to a planet being influenced by the gravity of the star it orbits, the planet’s gravity also affects the star. Astronomers are able to use sophisticated tools to detect the tiny wobble the planet induces as its gravity tugs on the star. As the HIRES survey moves into its third decade, the team members decided it was time to clean house. With so much data at hand and a limited amount of time, they recognized that more exoplanets would be found by sharing their catalog with the exoplanet community. Before giving everyone the keys to their exoplanet-finder, however, the team took it out for a spin themselves. Mikko Tuomi of the University of Hertfordshire led a sophisticated statistical analysis of the large data set to tease out the periodic signals most likely to be planets. "We were very conservative in this paper about what counts as an exoplanet candidate and what does not," Tuomi explained, "and even with our stringent criteria, we found over 100 new likely planet candidates." One of these probable planets is around a star called GJ 411, also known as Lalande 21185. It is the fourth-closest star to our own sun and has only about 40 percent of the sun's mass. The planet has a very short orbital period of just under 10 days, so it is no Earth-twin. However, GJ 411b continues a trend that has been seen in the overall population of detected exoplanets: The smallest planets are found around the smallest stars. 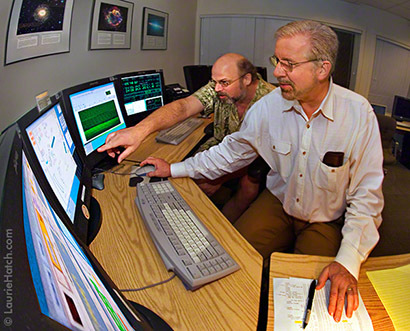 An open-source software package for analyzing exoplanet data (Systemic Console) was developed at UC Santa Cruz by team member Greg Laughlin and his students, primarily Stefano Meschiari. "One of our key goals in this paper is to democratize the search for planets," explained Laughlin, now at Yale University. "Anyone can download the velocities published on our website and use the open-source Systemic software package and try fitting planets from the data." The team is hoping their decision will lead to a flurry of new science as astronomers around the globe combine the HIRES data with their own existing observations or mount new observing campaigns to follow up on potential signals. The catalog release is part of a growing trend in exoplanet science to broaden the audience and discovery space, which has emerged in part to handle the follow-up of planets discovered by NASA's Kepler and K2 missions. 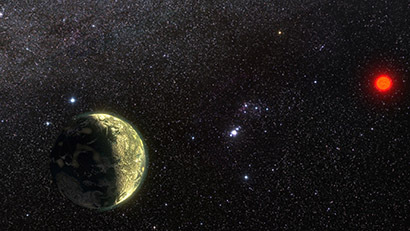 "I think this paper sets a precedent for how the community can collaborate on exoplanet detection and follow-up, moving forward," said team member Johanna Teske of the Carnegie Institution for Science. "With NASA's TESS mission on the horizon, which is expected to detect 1,000-plus planets orbiting bright, nearby stars, exoplanet scientists will soon have a whole new pool of planets to follow up." "The best way to advance the field and further our understanding of what these planets are made out of is to harness the abilities of a variety of precision radial velocity instruments and deploy them in concert. But that will require some big teams to break from tradition and start leading serious cooperative efforts," added team member Jennifer Burt, who earned her Ph.D. at UC Santa Cruz last year and is now at MIT.